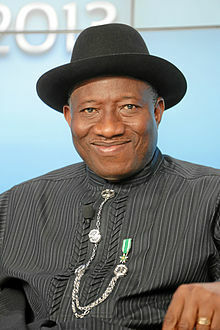 Goodluck Ebele Jonathan (ojoibi 20 November 1957) je oloselu omo ile Naijiria ati Aare orile-ede Naijiria lati May 6, 2010. Ohun ni Igbakeji Aare ile Naijiria si Aare Umaru Musa Yar'Adua ki o to dipo fun gege bi Adipo Aare ni 9 February, 2010 nitori aisan to de Yar'Adua mole. Leyin ti Yar'Adua ku ni May 5, 2010, Jonathan di Aare. Bakanna tele o tun je Gomina ipinle Bayelsa larin 9 December 2005 ati 28 May 2007 ati Igbakeji Gomina ipinle Bayelsa. The Cabinet of President Goodluck Jonathan which was formed during his time as Acting President, on 6 April 2010, is shown below. Ministers of State are not shown. The Cabinet of President Umaru Yar'Adua, which was formed on 26 July 2007, is shown below. The list shows Federal Ministers but excludes Ministers of State, who assist the Federal Ministers. The cabinet was dissolved on 17 March 2010 by Acting President Goodluck Jonathan, and a new cabinet sworn in in 6 April 2010. Àtunṣe ojúewé yi gbẹ̀yìn wáyé ni ọjọ́ 14 Oṣù Kẹfà 2015, ni ago 20:48.